Puerto Vallarta features sea side golf courses in addition to courses with spectacular views of the Sierra Madre mountains. Vista Vallarta hosted the 2002 World Golf Championships – EMC World Cup in Puerto Vallarta, Mexico. Spread across 478 acres, the Vista Vallarta Club de Golf encompasses two 18-hole, Par-72 championship golf courses: the first is a Signature Golf Course Design by golf legend Jack Nicklaus, and the neighboring course is a Signature Course Design by golf great Tom Weiskopf. Marina Vallarta is a 18 hole course designed by the famous American architect, Joe Finger, and located in the marina area of the district of Puerto Vallarta. It is a marvelous mix of typical tropical ambience of the Pacific coast with views of the Sierra Madre and Banderas Bay. Its spectacular hacienda style clubhouse is located just a few minutes from the most important hotels in Puerto Vallarta. 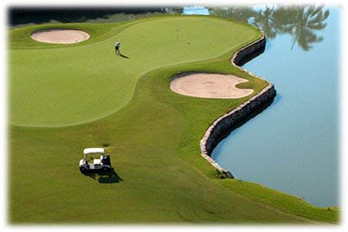 Marina Vallarta Golf Club, each year hosts the International Pro AM; one of the largest Pro Am in the world each December. Create the most exciting championship golf course in Mexico, was the challenge given to the team of Von Hagge, Smelek and Baril, designers of over 200 of the world’s finest golf courses. The result a 7,239 yard masterpiece. The memorable experience begins upon arrival at the Club, as golfers pass through an impressive stone archway resembling a Mayan temple, beside which a real Bengal tiger lives securely in his habitat. Further in, the 45,000 sq. ft. clubhouse sits perched in the heart of El Tigre offering spectacular views in all directions. The El Tigre course itself has been lightheartedly described as “… one of the most challenging in Mexico”, yet the course overall is considered forgiving even by less experienced golfers. Featuring winding views of the America river and surrounded by lush jungle, the Sierra Madre mountain range, 7 natural lakes, and the Pacific Ocean, this par 70 and 6,668 yard course is a natural and technical masterpiece. The course features optimal conditions to fit every player, from your low to high handicap. Recently redesigned by the game’s greatest, this Nicklaus Design golf course is especially challenging because of the constant, strong crosswinds coming off of the ocean. The course has 18 championship holes designed by Percy Clifford creator of some of Mexico´s top courses. Golfers of all skill levels appreciate Flamingos because it is challenging and fair. In addition to its great design, the course is also set apart from others in the area due to its beautiful rolling hill terrain, lush tropical forest and natural lagoons and mangroves. Nature lovers will be struck by the unspoiled scenery and the presence of various tropical and migrating bird species. In June 2008, Four Seasons Golf Club Punta Mita was named the number one golf course in the world by the readers of Condé Nast Traveler. The Nicklaus-designed course is set amid vistas of white-sand beaches and the surrounding Sierra Madre Mountains. Spread over 81 hectares (200 acres), the course takes full advantage of its seaside location. 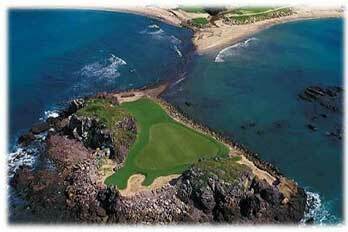 Eight holes border either the Pacific Ocean or Banderas Bay, and offer views of whales during seasonal migration.